Issue #238 • February 22, 2018•Buy Now! I was soaping my armpits when Mom pulled me from the shower. The hallway was filled with smoke, and she dragged me naked down it, through the living room, out the front door, and onto the lawn. Across the street our neighbors were in their yards, their faces illuminated by flames and their phones. Mom started walking, and I covered my crotch with my hands and followed her, happy nobody was laughing at me but wondering why no one was offering to help us. The Camry was parked down the street. We got in and when I turned to ask her what was happening, why the Harmons and the Goldsteins had ignored us while our house burned, she wore what Dad calls the Swedish Mask: a fixed look of calm, disappointment, and resignation. I knew not to ask any questions. Josh Russell’s novels are Yellow Jack, My Bright Midnight, and A True History. His short fiction has appeared recently in Epoch, Subtropics, and Cincinnati Review, and is forthcoming in the anthology New Micro. In early 2019, The Cupboard Pamphlet will publish his chapbook of very short stories, Suburban Folktales. He’s the recipient of a National Endowment for the Arts fellowship, lives in Decatur, Georgia, and is the Director of the Georgia State University Creative Writing Program. Around twelve years ago, I was visiting New Orleans and stopped in Faulkner House Books (a wonderful bookstore located on a street called Pirate’s Alley—who could resist? ), and while I was browsing, it started to rain. I mean, really rain. Sheets and sheets of water falling straight down out of the sky, pummeling the Quarter. I’d just made a purchase when the deluge started, and I stuck around to see if I could wait out the storm. For about half an hour I talked with the store’s owner, Joe DeSalvo, and he did what good booksellers do: he recommended and sold me books. By the time the skies cleared, I walked out with, I think, five books under my arm. One of them was a novel called Yellow Jack by Josh Russell. I started Yellow Jack on the plane ride back to New York and finished it soon after. (It’s a stunningly good novel—I highly recommend it.) 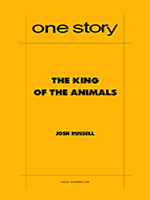 Jump forward twelve years, and a short story comes my way called “The King of the Animals,” by none other than Josh Russell. One of the many great things about reading: I felt like I was bumping into an old acquaintance. “The King of the Animals” is one of the funniest and strangest stories I’ve ever read. It’s set in the present day, in a world that looks an awful lot like ours, and while there might be a character in it who’s far more familiar than you’d ever want him to be, I promise you he doesn’t get any actual screen time. He sets a lot of terrible things in motion, but this story isn’t about him; it’s about love, family, survival, and, as the author says in our Q&A, innocence. If you aren’t familiar with Josh Russell’s writing, settle in for the weird and charming ride that he’s about to deliver. We at One Story are honored to put this new work of his into the hands of our readers. PR: Where did the idea for this story come from? JR: For several years of bedtimes I read to my daughter from the two hundred stories in Italian Folktales by Italo Calvino. Every night there would be a line that struck me, my kid, or both of us as interesting and/or funny and/or weird. I’d mark it, and when she fell asleep, I’d begin a little story by sampling Calvino’s versions of stories already many times reimagined: by the storytellers, who told and retold them, by Calvino, who collected and edited them, by George Martin, who translated them from Italian to English. Most of my stories ended up being very short—one or two or three pages, like many of Calvino’s. A dozen of those little ones became a chapbook called Suburban Folktales that’s forthcoming from The Cupboard Pamphlet. “The King of the Animals” started the same way. There’s a Calvino folktale with that title, and the line I marked was “Together they all left the palace, which immediately burst into flames.” In Calvino’s version, that’s a good thing: the palace is cursed. I made some changes for my version: The palace is a suburban split-level, burning it down is bad, etc. PR: There are two characters in the story—not shown, always “off-scene”—who are world-famous and never named. Did you ever consider naming them? And what effect do you think it has on the reader that they aren’t named? JR: I never wanted to name either, in part because I was playing around with the rules of folktales—the kings and queens and princesses and princes in Calvino’s tales are almost never named—in part because it makes me mad to say or type the man’s name and it makes me sad to say or type the woman’s, and in part because I fear there will be more Kings of the Animals and more goodhearted losers, so why limit it to two possibilities? I have a feeling readers will fill in the blanks, and maybe feel a little queasy—and maybe a little hopeful—when they realize how many names could be used to fill in those blanks. PR: Was the bulk of this story always going to be set in an IKEA? JR: Yes, even when I thought it was going to be only two pages long, and even when, for a couple of days, I considered trying to make it two hundred pages long. I love making visible again the weirdness of something I know so well that its weirdness has become invisible: IKEA, suburbia, teenage crushes. Can you remember your first trip to IKEA? That’s an objectively weird place, but after a few visits, it becomes normal. Also, I love IKEA. It’s a utopia, where everything is clean and orderly and European, in a vague fantasy-Nordic way. In the run-up to the 2016 election, there was a lot of talk about where people would move if either candidate got elected, and that made me remember the talk when I was a teenager about where people would move if Reagan got elected. Sweden seemed to come up in many of those discussions. PR: A question I always like to ask an author is, how different is the finished story from the one you originally conceived? Also, what surprised you the most as you drafted and revised? JR: I started this story in late 2016 as a half-joke about an unimaginable moment in American history when a tyrannical nitwit was elected president, so the biggest surprise was when the joke became reality. I was also surprised by how unable I was to write anything for months after the election. From what I hear, I wasn’t alone. When my wife did me the favor of telling me to quit moping and get back to writing, I was surprised by how hard it was to capture the first-person voice of a fourteen-year-old boy. It’s been a long time since I was one, sure, but there was something about imagining what it must be like to be a contemporary male teenager that was harder than imagining what it was like to be, say, a German immigrant in WWII-era New Orleans (which I do in my second novel, My Bright Midnight). That challenge was definitely a surprise. JR: Lucas’s dad is everything I fear I might be—a braying know-it-all who delivers angry lectures about how everything’s gone to hell, even though he knows those lectures are going to upset his kid. That moment in the story is also a wink to my daughter, who a couple of years ago was obviously terrified when I was diagnosed with colon cancer, but put on a brave face and told me everything was going to be okay, even when I wasn’t so sure, and, I fear, didn’t do a good job hiding from her that I wasn’t so sure. My hope is that we’re, at worst, somewhere between okay and probably not. PR: In the story’s closing notes, the news is dominated more by rumors and speculation than by the reporting of facts. One of the great tragedies of this phenomenon is that rumors quickly begin to hold more power than facts ever could. Do you think that’s always been the case? JR: When I was a teenager, I would see broadsides wheat-pasted to walls in Georgetown and by the National Gallery and outside METRO stations. My friends and I would laugh at their misspelled warnings about the New World Order and how Reagan was the anti-Christ. Now those broadside-hangers have Twitter accounts that look just like the New York Times’ Twitter, Facebook pages that look like CNN’s. PR: For as bleak as “The King of the Animals” is, there’s a lot of humor in it. Was it a conscious decision to infuse the story with humor as a way of balancing out the gloom, or was the humor already there for you, amidst all the absurdity, waiting to be spotlighted? JR: My favorite writers have always been those who can see humor in the darkness: Vonnegut, Leonard Michaels, Mary Robison, Lydia Davis, Patrik Ouředník, Christopher Merkner, Calvino. Balancing out the gloom is an important public service, one I seek to offer in all my work. JR: Rubber horse masks. Just kidding! How about: innocence. PR: The rubber horse mask thing in your story freaked me out, by the way. What are you working on now? JR: I’m finishing a short story that will complete a collection. Some pieces in the book are very brief, one’s fifty pages long, and the rest are somewhere in between, including the titular story: “The King of the Animals.” Hopefully someone will like The King of the Animals enough to give it a loving home. PR: What is the best bit of advice about writing you have ever received? JR: “Read this!” The books that people have enthusiastically recommended or required I read have taught me more than any tip about using a pen, not a pencil, etc.